I have a personal interest in the Iditarod for several reasons. I lived in Alaska for almost 10 years prior to moving to California. The ceremonial start of the Iditarod in downtown Anchorage had the mushers running their dogs right past my office window. You could not live in Alaska and not be familiar with mushing, sled dog racing and the Iditarod in particular. It is a huge event and is heavily promoted by the Alaskan government and private sector businesses because it is highly profitable for the state. As someone who also rescued dogs in Alaska, I was keenly aware of their mistreatment in the mushing industry and the fact that to hone their teams, mushers continuously bred their dogs and then selected the ones they deemed most fit to train. The rest were sometimes killed outright and sometimes dumped at local animal shelters. Personally, I had three dogs who were rejected sled dogs that I adopted from the Anchorage pound. The persistent breeding of dogs, particularly amongst mushers who race for money, is one little-known fact of the industry. It is important to note that while the race is purported to be a recreation of the famous "serum run" delivering vaccinations to Nome, that run -- a mission of mercy for people -- was also far kinder to the dogs. That race was run in relays by different teams of dogs. As a human and dog endurance test, the Iditarod bears no resemblance to the original run. Forcing dogs to run the entire distance is inherently dangerous and cruel. Dogs suffer. Since the race began decades ago, more than 140 dogs have died during the event -- from heart attacks, pneumonia, muscle deterioration, dehydration, diarrhea, and spine injuries. They are impaled on sleds, drowned, or accidentally strangled. While the industry likes to say that sled dogs love to run and pull -- which is true -- this is primarily a function of living most of their non-pulling life crowded into small kennels with no state management or oversight. They might be tethered on short chains at all times, unable to play, forced to sit, stand and lie in the same small area in which they eat and defecate. Commonly, dogs who can longer pull competitively are dumped are killed. The race is also hazardous to Alaska's wildlife, already stressed during the winter months. Moose encountered along the trail, for example, may be killed by mushers. In some circumstances dogs have also been killed by moose when one suddenly encounters them. Moose mothers with calves are particularly aggressive in defense of their young. 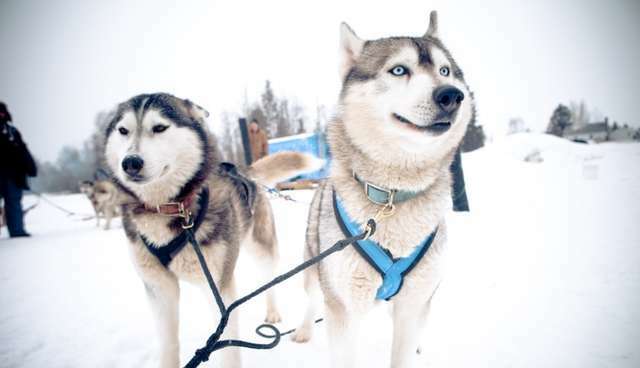 Like many sports, the introduction of money, including cash and consumer goods prizes for winning mushers, has increased the pressure on mushers, and therefore their dogs to perform competitively. In the Iditarod, each participant pays an entry fee of more than $3,000, and winnings of up to $650,000 are shared among the top thirty. This pressure to win leads to much of the mistreatment of dogs both on and off the race track.